You may install CodeReady Studio standalone (A), or also install it with Red Hat JBoss Enterprise Edition (B). Download CodeReady Studio 12.11 standalone. Run the CodeReady Studio installer. Navigate to the folder that contains the downloaded CodeReady Studio JAR file. Navigate to the folder that contains the CodeReady Studio JAR file. Follow the on-screen instructions to continue the installation process. Start CodeReady Studio. See CodeReady Studio 12.11 Installation documentation for details. In CodeReady Studio, click Window→Preferences. 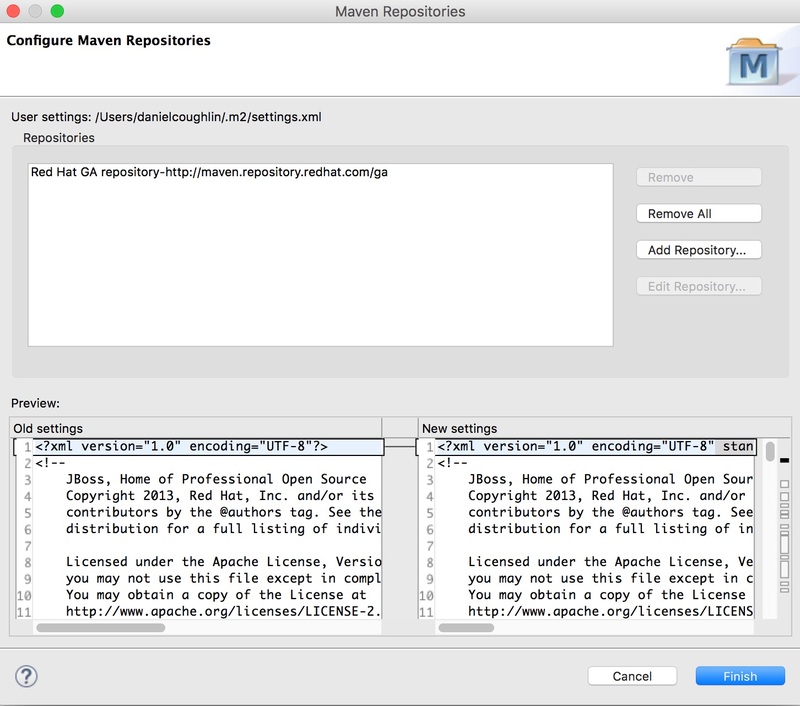 Type maven in the text box to view options related to Maven. In the results, expand JBoss Tools and click JBoss Maven Integration. 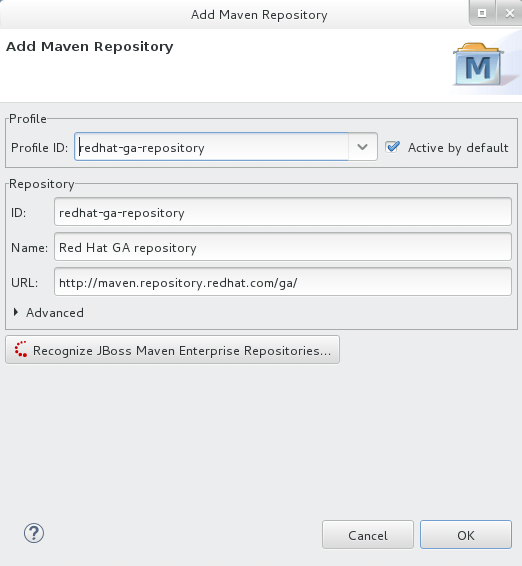 Click Add Repository and then click the downward facing arrow in the Profile ID: field to view the available Maven repositories. Select redhat-ga-repository from the drop-down list profile and then click OK.
Answer Yes when asked about updating the settings.xml file. Once CodeReady Studio is installed (above), you can download, install, and set up JBoss EAP from within the IDE. Click Window → Preferences, expand JBoss Tools, and then click JBoss Runtime Detection. In the Paths pane, click Download. In the Download Runtimes window, from the Download Runtimes table select the JBoss EAP version that you want to download and click Next. Note: For JBoss EAP 6.1.x and later, continue to follow the steps given here. For JBoss EAP 6.0.x and earlier, follow the on-screen instructions for downloading JBoss EAP from the Red Hat Customer Portal and after JBoss EAP is installed continue to use runtime detection to set up JBoss EAP from within the IDE. In the JBoss.org Credentials window, enter your credentials and click Next. In the Runtime JBoss EAP_version window, read the terms and conditions, and then click I accept the terms of the license agreement and then click Next. Note that if you have previously accepted the terms and conditions in the IDE or through the jboss.org website, this window is skipped. In the Download Runtime window, in the Install Folder field, click Browse and choose a location in which to install JBoss EAP and click Finish. The Download JBoss EAP window shows the progress of the download. Click Apply and Close to close the Preferences window. Result: The server is listed in the Servers view in stopped mode. In CodeReady Studio, Open the Red Hat Central view. icon on the main menu bar. Type helloworld into the search box and click the helloworld-rs quickstart shown in the result. Click Finish. This downloads the helloworld application and its Maven dependencies. Once all the dependencies are downloaded, a dialog appears to tell you that your project is ready. Click Finish. In the Servers tab, select Red Hat JBoss EAP 7.0 [Stopped] and click the Start the Server icon to start the JBoss EAP server. Once the server starts, right-click the jboss-helloworld application in the Project Explorer view. From the menu that appears, select Run as.. and then Run on Server. Select the newly created JBoss EAP server, click OK and then Finish. This will build, deploy, and run the helloworld application in the JBoss EAP server. The application opens in the internal default CodeReady Studio web browser and presents the "Hello World!" Success page. Follow the below series to build your first application. You will build some simple examples as well as build a TicketMonster Application using JBoss EAP. The TicketMonster application shows you how to build a modern HTML application that communicates with a Java EE backend using REST. The series walks you through each step of the application development lifecycle, from start to finish. Want to know more about what you can do with CodeReady Studio?